Q: Are you having identical or fraternal twins? This was one of our first questions too, and it is surprisingly difficult to answer. Since we only discovered there were two babies at 20 weeks, apparently we will never be totally sure unless we have a DNA test done on the babies after they are born. What we do know is that the babies each have their own amniotic sac and what appears to be one fused placenta. This means they are likely fraternal (dizygotic), or formed from two fertilized eggs. 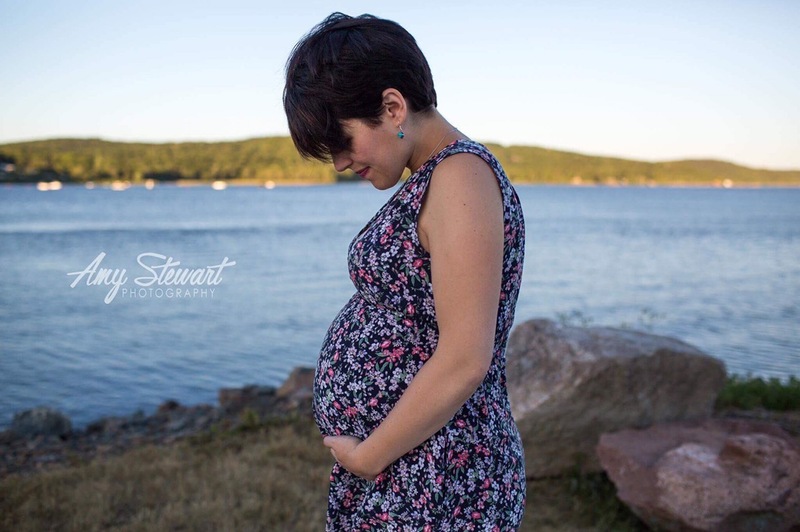 This is the most common kind of twin pregnancy. We are happy with this news because it generally lessens the risks associated with being pregnant with multiples. Identical twins (monozygotic), who form from one fertilized egg that splits, generally grow in one sac and share a placenta. This can lead to risks such as Twin to Twin Transfusion. But identical twins can sometimes have their own sacs and placentas if they separate in the very early days of conception. Clear as mud? Suffice it to say, we think they are probably fraternal, but we are not totally sure! Q: Do twins run in your family? Twins are all throughout Mark’s family tree. Mark’s siblings are twins, his mother is one of two sets of twins in her family, and his cousins are twins. In my family, twins are a less frequent: I have second cousins who are twins, but that’s about it. Fraternal twins can run in families, and identical twins don’t. This is because fraternal twins come from “hyper-ovulation,” or the release of more than one egg in a cycle, which is a trait that can only be passed down from the mother’s family. So even though the twin gene runs strong in Mark’s family, it has no link to our pregnancy! Hyper-ovulation can also be caused by advancing maternal age, and I am 34 years old. It can also just be a random occurrence! 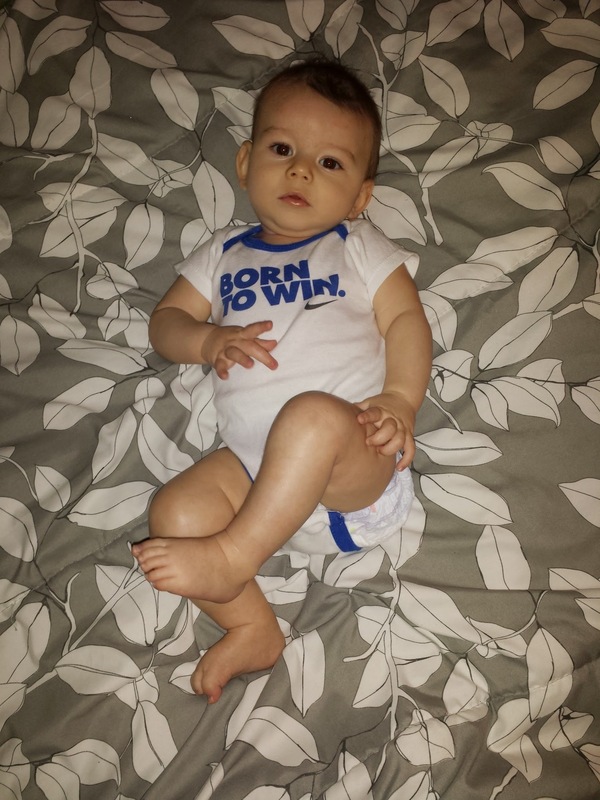 Put simply, we won the baby lottery, because the chances of having twins are 1 in 67. How lucky are we? For the past five years, I’ve capped off most days by writing a couple of these, followed by the news. When you have something on the screen, it’s easier to get started on the story. Now I have a whole year of parental leave. 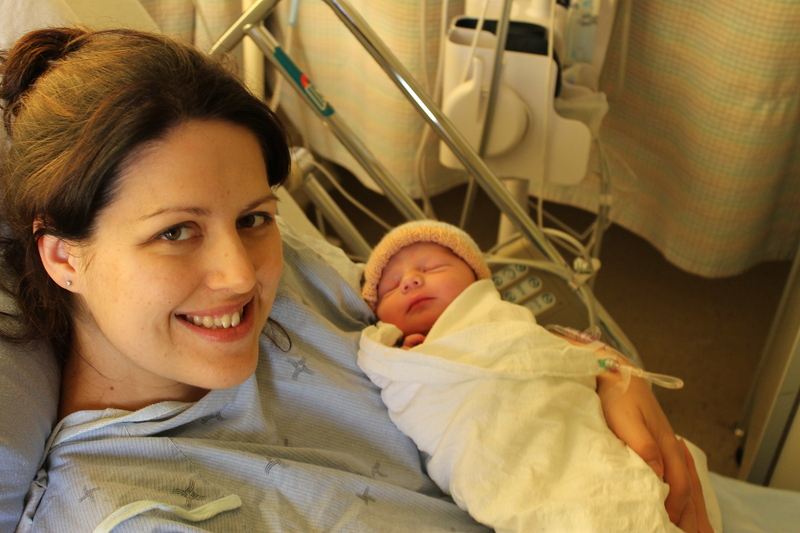 A year to learn a new skill that I hope makes me better at everything: motherhood. (Can you add that to LinkedIn?). On Friday, after a whirlwind news week for New Brunswick, I said so-long to my work mates and headed for home. It will be such an adjustment to focus away from news and inward toward family for the new several months. So far, about one week in, I am loving it. With less than two weeks to go before we meet our baby, I have been bustling with energy, trying to get our home ready. I am a real list person and there are sticky notes everywhere. I have been cleaning, shopping and gardening. By the end of every day, I’m exhausted. 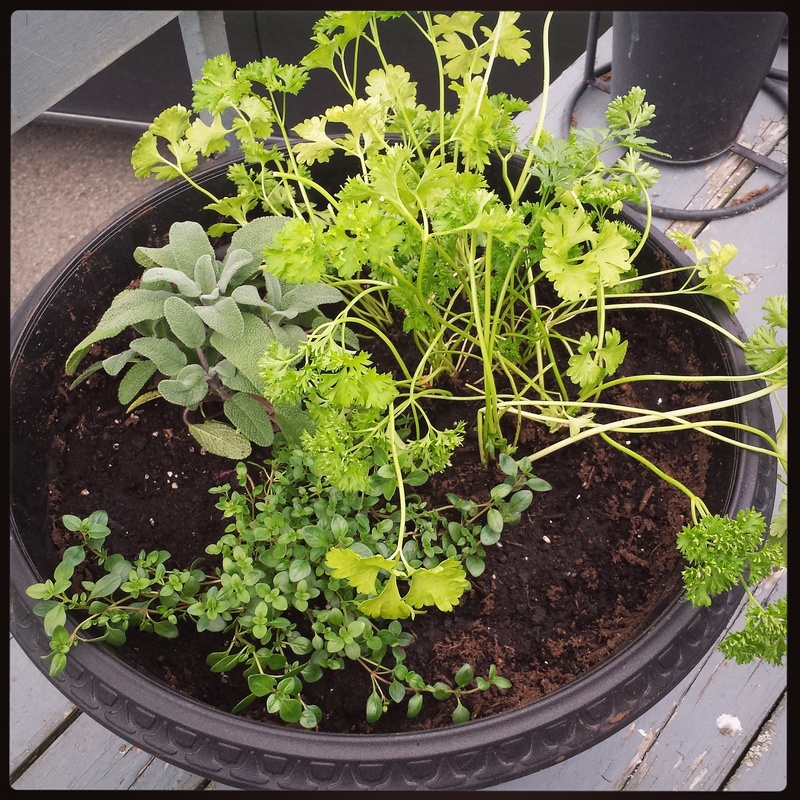 I planted some herbs on our deck as well as a mini-vegetable garden in our back yard. I’m still trying to go for walks at least a few times a week to keep active and fit. With this beautiful June weather, it’s not hard to find an excuse to get outside. A couple days ago, as I walked (ambled?) through our neighbourhood, another mother pushing a stroller yelled out “You go girl!” from across the street. It encouraged me to continue at a much brisker pace than normal. Today, halfway through my walk, I got some pain through my back and couldn’t wait to get home. At first I thought it might be the start of… something. But I think I was just sore and tired. It’s always an interesting balance, keeping fit while pregnant. 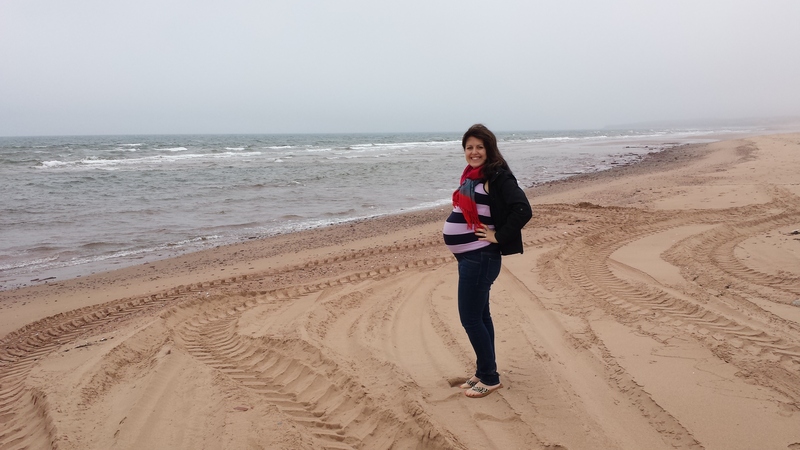 Visiting Cavendish, PEI, at 36.5 weeks. If the baby comes by the due date (June 25), that means there are only 13 days to go. It will be gone in a flash. My goal is to get my to-do lists taken care of now so I can relax with my husband for the rest of our pre-baby time. What a blessing this pregnancy has been. I’m ready for motherhood. Bring it on! 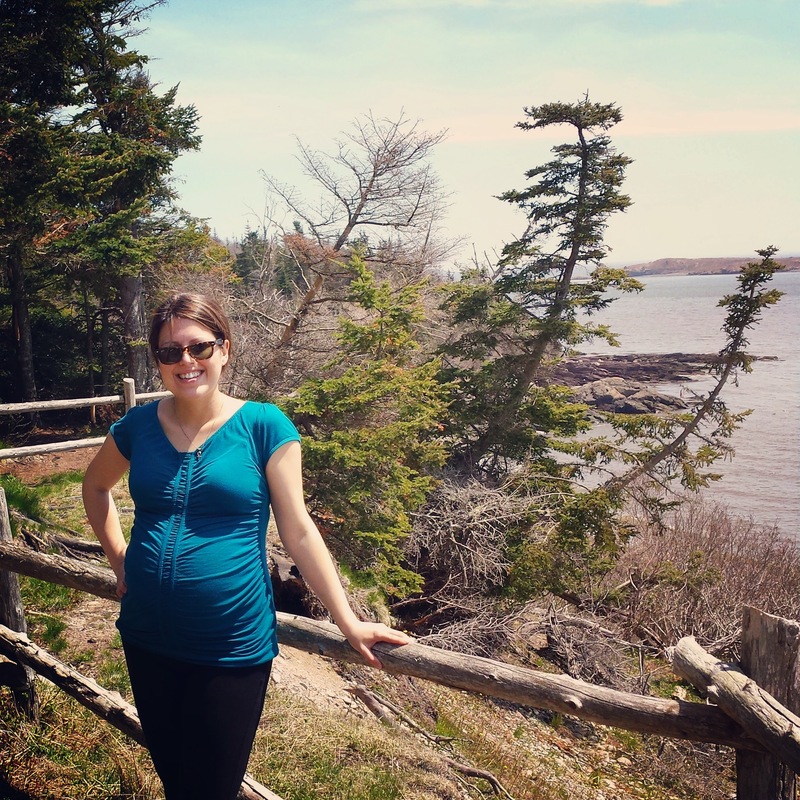 Although strenuous activity is out the window at this point, I have still been making an effort to keep moving through this final stage of pregnancy. Most days it hasn’t been too difficult because I’m in serious nesting mode, feeling restless and wanting to do something. Other days (like today), I feel lethargic. I am not a napper but napped today for the first time in forever. The more seasonal spring weather has helped motivate me to get outside and just walk. Walking feels good, refreshing and energizing. I think I had underrated how pleasant it is. I also enjoy walks in my west-side neighbourhood and usually keep to a 30-40 minute walk on weeknights. One of the best things about walking vs. running is you really take in more of your surroundings. I’ve talked to and greeted more of my neighbours and taken closer notice of people’s lovely gardens and homes. 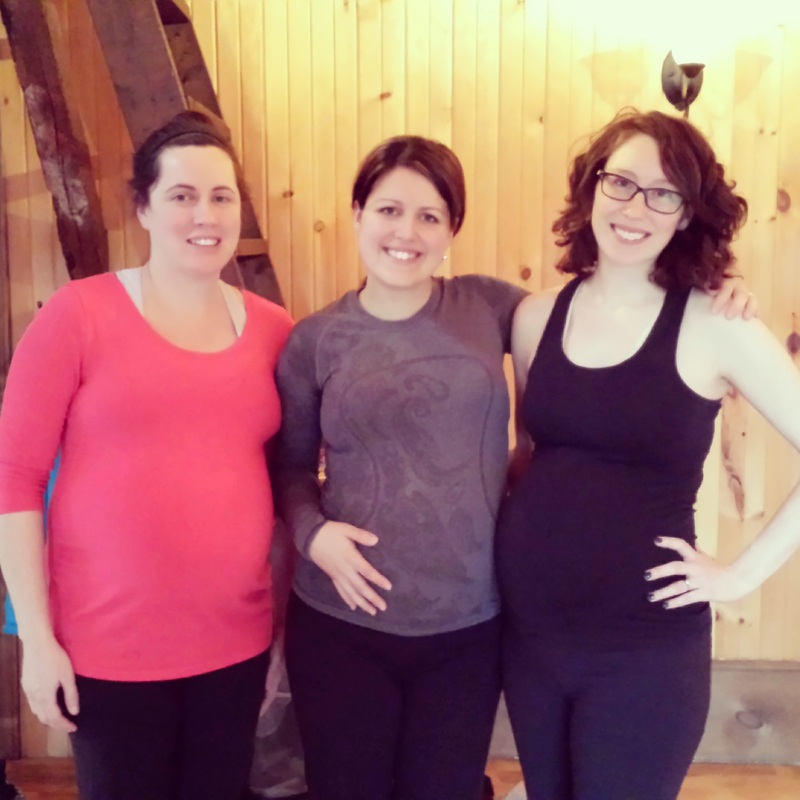 Aside from that, I have enjoyed pre-natal yoga. For six weeks, I was enrolled in a class at the Amana Institute taught by Heather MacLean-Reid. It was a wonderful, relaxing, invigorating experience and I was sorry to see it end. I was hoping to keep coming sporadically but haven’t made it back for a drop-in class since. Unfortunately, the studio is about a 30-minute drive away, but I felt like it was worth it. I also car-pooled with two of my mommy buddies. We are all due within three weeks of each other! Lastly, I have been trying to keep up some strength exercise, since I know that’s so important to labour, delivery and recovery. The problem has been that I was so used to tough bootcamp-style stuff that I didn’t know what to do and just sort of gave up. For the past couple weeks, I’ve started my strength routine again with some easy-peasy stuff I found online. It’s great because I can roll out my yoga mat and get through the exercises and stretches within an hour. I only have two-pound weights at home but make the sets more challenging by upping the repetitions. I also add in more squats (done without the stability ball) and more side planks. I say easy-peasy but truth is, by the end, I’m hot and out of breath. 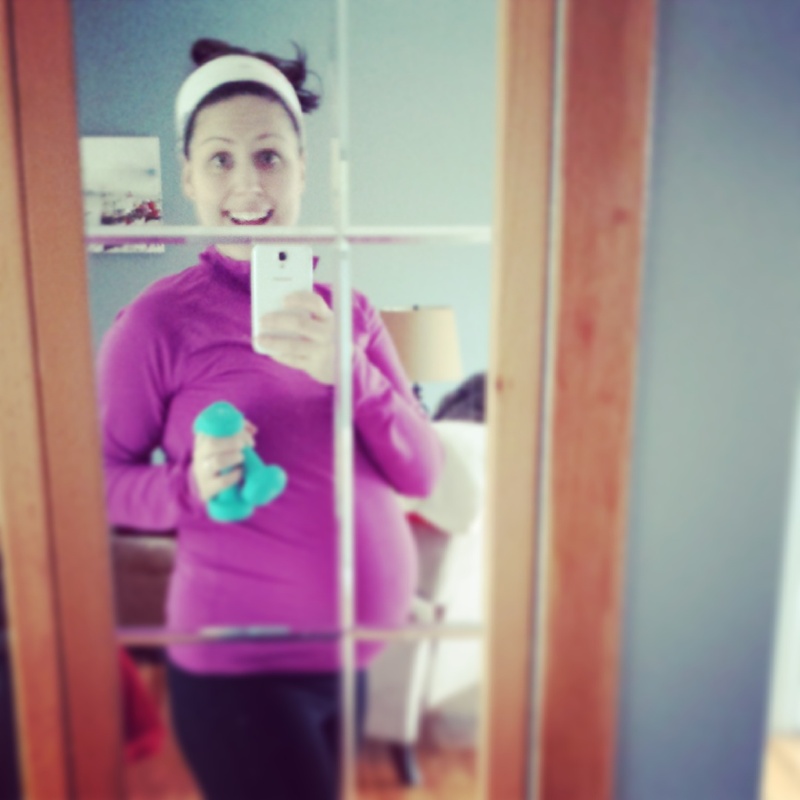 Not sweating, and not panting, but that’s the whole point of working out in your third trimester. 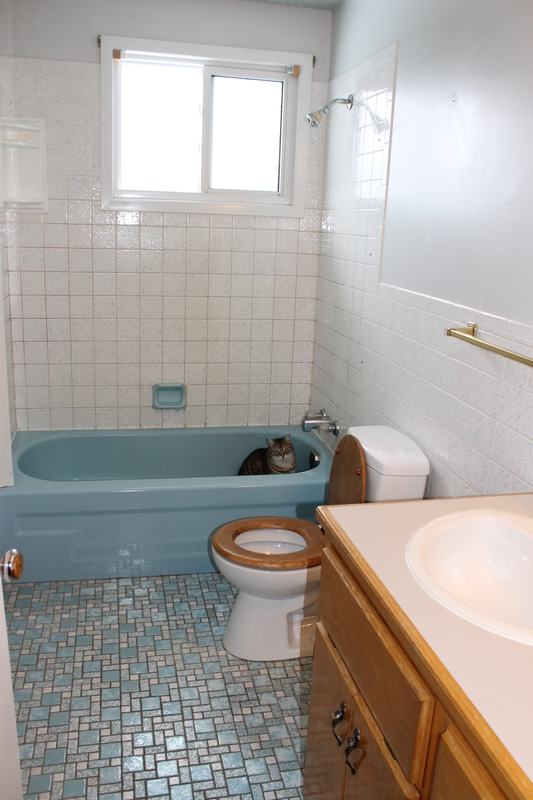 As of last weekend, our bathroom was finally complete. 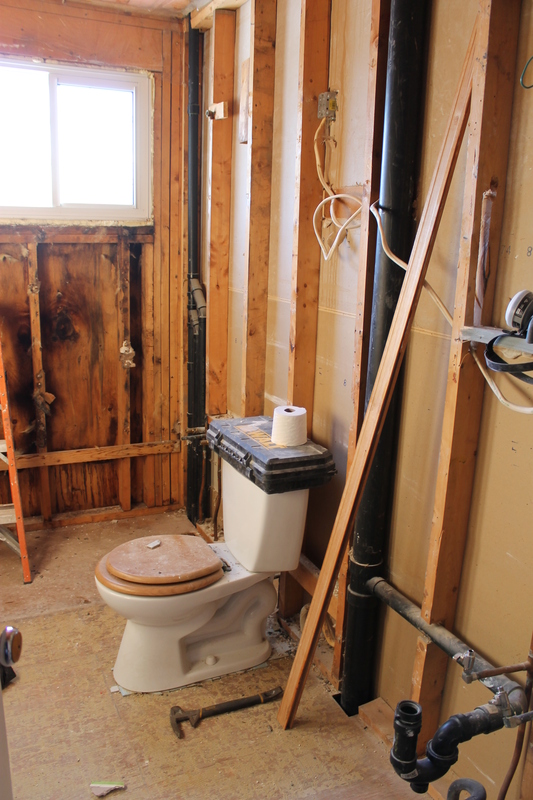 It was our first major home renovation since we moved in two years ago. Although we hired a contractor to do the work, it was still hard (especially living without a shower for more than two weeks!) Thank goodness we have another half-bath in the basement. Here are some before-and-after shots. We’re very pleased with the outcome and it feels very grown-up to have taken this on… Now that we have a good contractor, we also feel inspired to take on more projects. Next step: new windows for our bedroom and the baby’s room. Now that I don’t have to go to the gym to shower anymore, my workouts have been much more relaxed. That was except for my weekend spinning class, which I was enjoying right up until last weekend, in my 30th week of pregnancy. I felt fine, energetic even, during the class. Drank what I thought was enough water. Ate a little breakfast beforehand…. but about 20 minutes after class, a feeling of faintness overcame me. I suddenly felt hot, nauseous and my head filled with black spots (to me it feels like pins and needles in my head). I was with my friend at Starbucks but was sitting at a table. I laid my head down and luckily the feeling passed. I spoke to my doctor about it (it actually wasn’t the first time this happened, but the first time post-workout), and she didn’t seem too alarmed. It was probably caused by the hot conditions in the spinning classroom. I also probably didn’t drink enough water… and yes, the class was probably a little too strenuous for me. Another ego check… time to slow down – again! Today Mark and I went for a walk and ran for about a block just for fun. Well, it didn’t feel very fun. My legs were on fire and my breathing was heavy, not to mention the tightness in my hips. 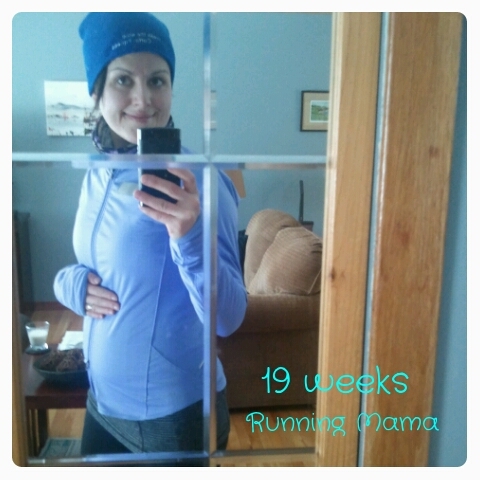 Wow… just a couple of weeks off running (and a growing belly) can make all the difference. I hope to keep up regular exercise until the very end – I find it really helps with my energy levels. Yesterday I was such a slug. Came home after work, went out for dinner, and fell asleep by 7:30 p.m. (no word of a lie). It kind of backfired on my when I woke up starving at 4 a.m. and couldn’t get back to sleep. So I stayed awake all day scurrying/nesting around the house and I don’t feel tired at all tonight. I figure it must be the fact that I kept active. 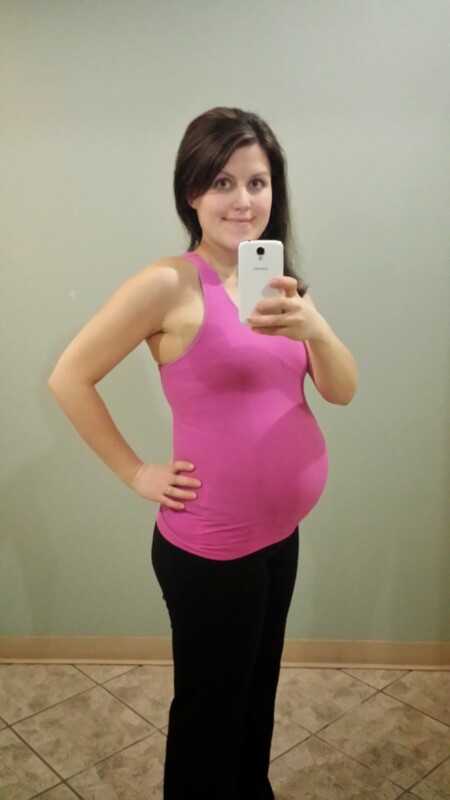 One thing is for sure: through all of this, the little bundle of joy in my belly keeps moving constantly. Someone’s having a good workout… even if it’s not me!